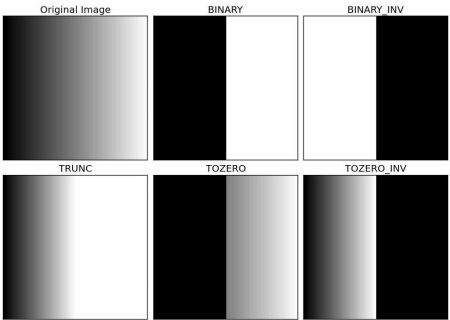 In this tutorial, you will learn Simple thresholding, Adaptive thresholding, Otsu's thresholding etc. You will learn these functions : cv.threshold, cv.adaptiveThreshold etc. cv.ADAPTIVE_THRESH_MEAN_C : threshold value is the mean of neighbourhood area. 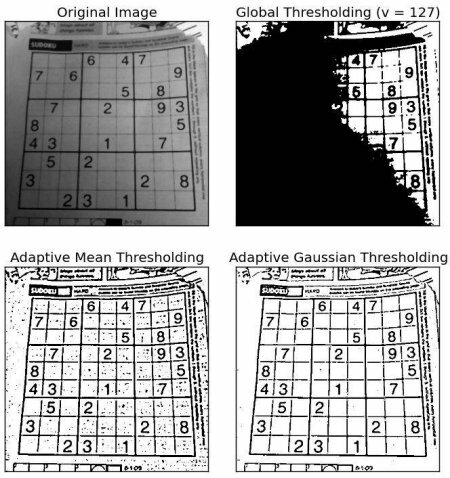 cv.ADAPTIVE_THRESH_GAUSSIAN_C : threshold value is the weighted sum of neighbourhood values where weights are a gaussian window. For this, our cv.threshold() function is used, but pass an extra flag, cv.THRESH_OTSU. For threshold value, simply pass zero. Then the algorithm finds the optimal threshold value and returns you as the second output, retVal. 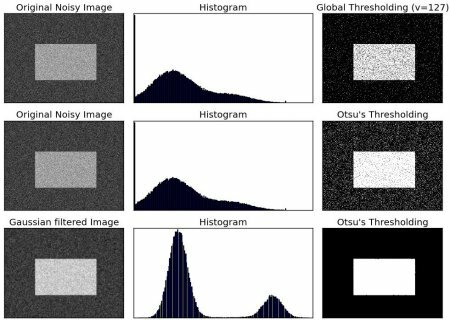 If Otsu thresholding is not used, retVal is same as the threshold value you used.